Almost no other diet has won over such an exceptional amount of dieters as the ketogenic diet has. This high-fat low-carb diet has received more than just a ton of hype – it’s become one of the new-age preferred diet programs, despite numerous possible risks and doubts that have arisen over time. New research from UBC’s Okanagan campus studied the diet program further though and came to a startling conclusion: just one cheat day where you consume just one 75-gram portion of glucose can damage your blood vessels. There’s no doubt that the ketogenic diet might be effective for weight loss as it puts the body to ketosis – a state where your body is essentially starved for glucose and your body starts burning fats. Since the body is so deprived of carbohydrates, your body might react badly whenever you reintroduce glucose. The researchers studied how the body reacts when 75 grams of glucose is introduced to the body after a high-fat low-carb diet. For that, they let their test subjects to consume one 75-gram glucose drink both before and after following the diet – which consisted of 70 percent fat, just like the ketogenic diet. As a result, the researchers found that blood vessel walls were damaged because of the sudden glucose spike. When you introduce glucose suddenly to your body after it has already reorganized its metabolic processes, your blood vessels cells might start to shed and die since your body reacts to that excess blood sugar. What’s worse, the damage on blood vessels was so extensive it could be compared to people with decreased cardiovascular health. And all of that just after one cheat day – one 75 gram dose of glucose. While the study was small, it’s still alarming, showing a possible strong connection on how cheat days actually affect the body. Most modern diets include cheat days – for example, the popular Slimming World’s diet has a separate definition “syn” to describe “cheating foods”. In fact, cheat days have become so common among dieters that most believe one cheat day per week is healthy. This new research proves though that sudden changes in the diet might make things far worse than before even starting with the diet program. “Our data suggests a ketogenic diet is not something you do for six days a week and take Saturday off,” mentioned the researchers. According to the theory of cheat days, introducing a sneaky snack that’s normally not included in your diet might “trick” your body into believing that you’re actually eating more calories, so your metabolism might not slow down as it might do during a normal diet that contains fewer calories. Essentially, cheat days are used to prevent your metabolism from becoming slower. Additionally, it’s believed that a cheat days help you to stay on track better since you feel like you aren’t depriving yourself of all the tasty foods out there. However, cheat days can do a lot more harm than good. Firstly, most dieters tend to go overboard with their cheat days because “it’s the one day they can eat anything and in any amounts”. Many don’t just stick to one bar of chocolate or one soft drink, instead, they might grab such an amount of food that it could feed 5 people. Avoiding overeating can be tough even normally but when the cheat day introduces the mental framework of “having the opportunity to eat”, overeating is prone to come easily. Additionally, research has found that just a single day of excessive eating can reduce insulin sensitivity, therefore putting you at risk of developing diabetes. The term “cheat day” itself is even more problematic. A diet isn’t actually a short-term eating plan – it’s a way of life that belongs in your daily routine. The healthiest diets are not temporary diet plans, but lifestyle choices, such as the Mediterranean diet that comes from the Mediterranean culture where that diet is a natural way of life. There’s no need to cut off treats from your life, what matters is a healthy balance. Cheat days, in their essence, completely overthrow that healthy balance and instead, strengthen food’s position as your enemy – while, in reality, it should never ever be that way. No food should be your enemy, but most temporary diet plans restrict the lifestyle so extensively that even eating a piece of cake can be considered “cheating” though it’s actually a normal part of life. 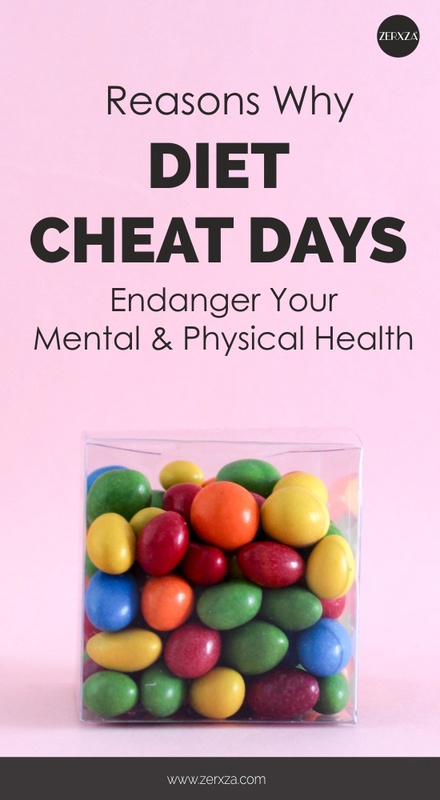 When including “cheat days” in your lifestyle, it gives your mind a signal of some parts of your diet being wrong and sinful though you should actually follow a healthy balance that doesn’t ban anything. Think about it this way. If you love your husband and the mutual life you have together, would you really want to cheat on him? If you follow a healthy balanced diet and healthy approach to food in general, there’s no reason to binge eat. A treat here and there is completely okay while shaming yourself only makes you more inclined towards falling off the track with your eating habits. Unhealthy relationship with food combined with potentially very serious health issues are enough reasons to stop taking cheat days. When you’re following a healthy balanced diet, there’s no need for cheating anyway since you won’t feel deprived of anything in life. An occasional cookie or a piece of cake at a party doesn’t make you a cheater, but binging because of harsh dietary restrictions is almost a surefire way towards falling off the track.